Berwick District Road Board was created in 1862 and was proclaimed a Shire in 1868. In 1889 its Scoresby Riding was severed to form Fern Tree Gully Shire. The Shire then stretched east of Dandenong, about 35 km east of Melbourne, as far as Bunyip, about 75 km east of Melbourne. To the north, it extended to Lysterfield and Gembrook and to the south encompassed part of the Kooweerup Swamp. Its area was 384 sq km, bisected from east to west by the railway line and highway to Gippsland. Berwick was the main town. Pakenham became the prominent town of the small townships which grew up along the railway line. 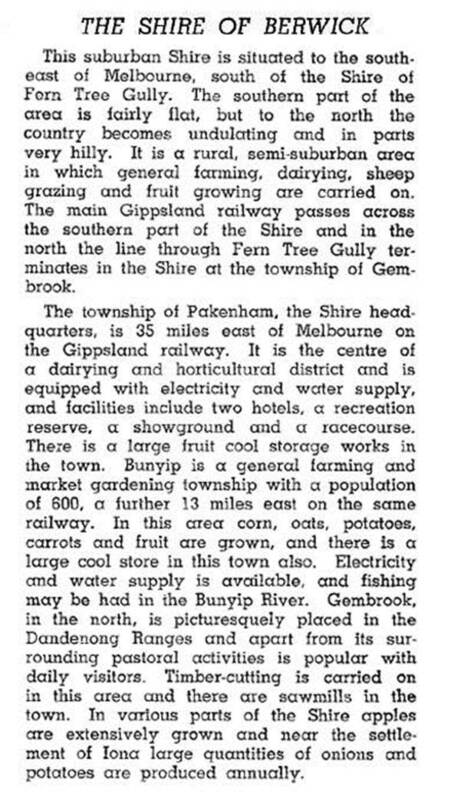 In 1902, the Shire headquarters were moved to Pakenham from Berwick. The shire's character changed greatly from the 1950s. In the western part, there was major industrial and housing development. At Doveton, close to Dandenong, there was a large Housing Commission settlement. Many large and small factories were established in the same area. Berwick and nearby Narre Warren were engulfed by new housing subdivisions from the 1970s onwards. In 1973, the shire was subdivided, forming the City of Berwick and the Shire of Pakenham. In 1978, new Shire Offices were opened at Narre Warren, adjoining Fountain Gate regional shopping centre. The new city was one of the most rapidly growing areas in the state, with a population of 50,000 in 1986 rising to 88,000 in 1994. Its area was 120 square kilometres. In 1994, most of the City of Berwick was united with most of Cranbourne Shire to form the City of Casey.